Checklists are not a new concept; they have been around for decades since pilots first started using them to ensure they followed all the necessary steps during take-off and landing. Since then, checklists have made their way into most fields - construction, medicine, the culinary arts, investment banking etc. They are the most useful way to ensure that you have taken all the necessary steps to complete a project successfully, and they take the pressure off trying to remember every little detail. 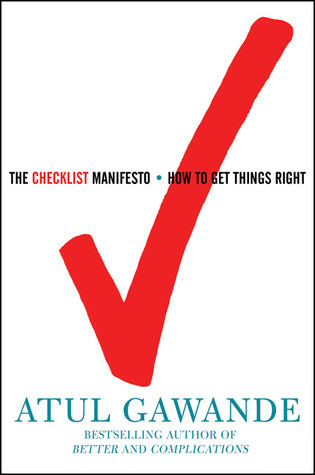 Filled with personal anecdotes and historical reviews of how checklists are a useful tool for just about anyone, The Checklist Manifesto provides a guide on how to construct a checklist to use for your tasks and projects. We have compiled all the advice from this book into a series of habits that can be easily used to create your own checklist system to help you complete projects with ease. Atul Gawande is the author of multiple bestselling books, including The Checklist Manifesto. He is also a surgeon at Brigham and Women’s Hospital in Boston, a staff writer for The New Yorker, and a professor at Harvard Medical School and the Harvard School of Public Health. He has won the Lewis Thomas Prize for Writing about Science, a MacArthur Fellowship, and two National Magazine Awards. In his work in public health, he is Executive Director of Ariadne Labs, a joint center for health systems innovation, and chairman of Lifebox, a nonprofit organization making surgery safer globally. He and his wife have three children and live in Newton, Massachusetts. Create checklists for all your important tasks/projects.